An Iridium Prepaid plan is a great way to use Iridium satellite service with no monthly fees, credit checks, unexpected service charges or security deposits. These prepaid plans can be used with any Iridium satellite phone (9500, 9505, 9505A, 9555, Extreme, GO! ), regardless of whether it was or wasn't purchased from SATTRANS. The Emergency Plan 300-min offers a lower cost option for individuals and organizations who need satellite communications only for emergencies or occasional use. Global Plans feature one flat rate for the entire Iridium coverage area. Our most popular plan is the Global 600-min plan with 1 year of validity. 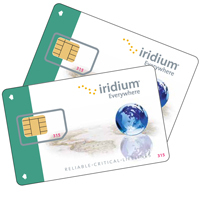 If you expect to use your Iridium phone extensively, consider higher usage plans with rates lower by 30-40%. Calls to other satellite networks are 9 times of the regular global call rate. The Latin America Plan offers discounted airtime rates for customers using Iridium satellite phones from South and Central America (excluding the Caribbean). The Latin America Plan can only be used within South & Central America (NOT including the Caribbean). It WILL NOT work anywhere else.